slipcovered. | there's no place like gnome. There is likely little guesswork involved to realize that I’m poor. Student loans helped get me through school but they are no fun to pay back on a beginning pastor’s salary. That being said – I take all the free furniture I can get. 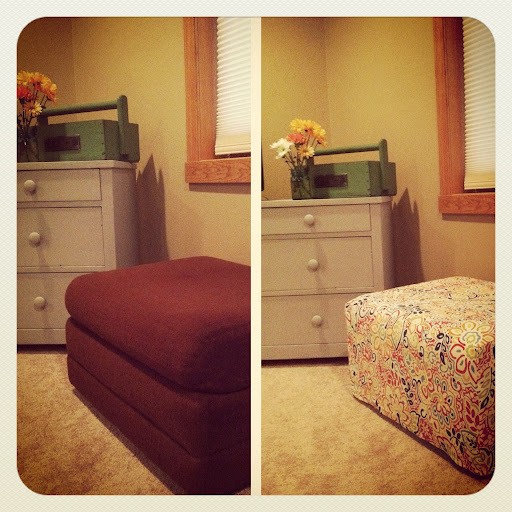 Like this ottoman from my mom’s house. She asked me if I wanted it over the phone and I think I said, nah. It was kind of ugly. But then I remembered I was poor and live in a huge house with only enough furniture to make 1/3 of it livable. Okay. Sure. I’ll make a slipcover for it. I bought the fabric ages ago and had it draped over the ottoman for months. The task of actually sewing a slipcover scared me. I don’t sew three-dimensional things like that. I sew quilts. They’re flat. A slipcover? I didn’t quite know how to tackle it. I knew I wanted something simple and something that would only take a night to complete. Thank you, design*sponge, for this tutorial. Slipcover done in a matter of a couple hours and it looks so much better than the maroon furry-ness of before. It does the job and I think does it well.